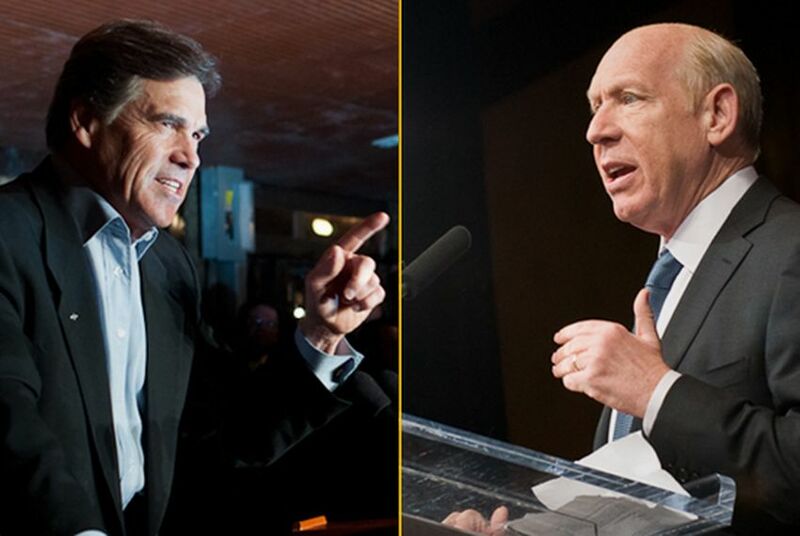 Bill White and Rick Perry fought over the hotly contested high school drop-out rate on Tuesday. Is it 30 percent (White)? 10 percent (Perry)? Or, more likely, somewhere in between? The major-party candidates for governor on Tuesday waded into one of the oldest and hottest debates in public education — what’s the real high school drop-out rate? — producing the kind of fireworks that suggest the state is in store for a nasty general election battle. What’s the truth? Both statements are technically correct — yet neither is exactly true, according to the most reliable dropout figures. Both lack context and ignore other readily available data. Ultimately, however, White’s figure may be the closest to reality, as a Texas Tribune analysis of the many and conflicting dropout-counting methods showed last year before the candidates ever started fighting about it. Perry’s number comes from the rosier of the two dropout counting methods employed by the Texas Education Agency, called the “completion rate.” The completion rate assumes students who continue in high school past four years will graduate — no sure thing. It has come under attack from advocates of a variety of political stripes, from the Texas Association of Business to the Mexican American Legal Defense and Educational Fund. “Nobody outside that building [the TEA] believes … that number,” Bill Hammond, TAB’s president, has said previously of the completion rate. White's figure seems to be a composite of more negative — and perhaps more realistic — methods of counting the drop-out rate. Its basic flaw is that it gives no credit for students who might take more than four years to graduate, which does happen, or might quit Texas public schools for other reasons, such as moving out of state or enrolling in private school. Consider, for example, the class of 2007-08, as best tracked through a variety of available state figures. The '07-'08 graduating class started ninth grade with more than 370,000 students and ended with about 237,000. So the percentage of students failing to graduate from a Texas public high school within four years was 36 percent — higher than White’s claim of 30 percent. But not all of those students dropped out. Another TEA figure attempts to account for those students who don’t drop out but don’t graduate from a Texas high school within four years. That measure, called the longitudinal dropout rate, suggests only 21 percent don’t cross the stage. A separate federal accounting — using state-submitted data, but under more stringent rules — puts the figure at 28 percent, based on 2006-07 data, but it doesn't count as graduates students who may take longer than four years. There’s no perfect dropout rate, and researchers continue to squabble over the right way to count it. There’s also the currently unanswerable question of whether individual schools who give the data to the state — and have incentive to understate the number, if anything — are submitting reliable individual student data. Many education observers consider the long-standing fight over the figures a distraction from the more complicated and important work of getting more actual students across the graduation stage. One point even Perry and White could agree on: Whatever the true dropout rate, it's too high.